still sitting there in pieces as of today. 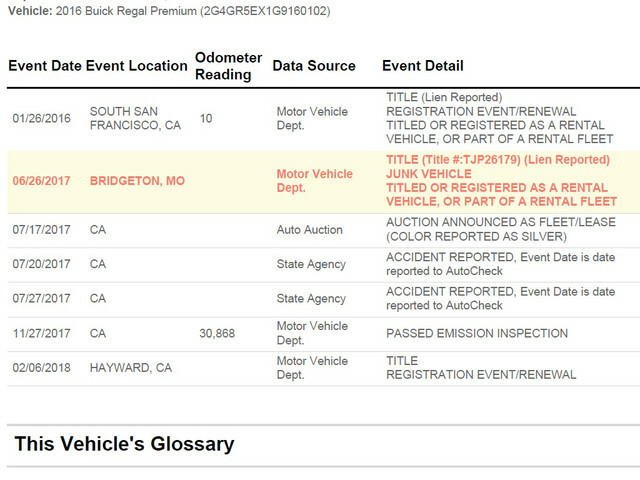 Ran vehicle history on the VIN after being referred where by local DMV Investigations department. Applied By: MISSOURI Applied On: 06/26/2017 Brand Explanation: The vehicle is incapable of safe operation for use on the roads or highways and has no resale value except as a source of parts or scrap, or the vehicle's owner has irreversibly designated the vehicle as a source of parts or scrap. This vehicle shall never be titled or registered. Also known as nonrepairable, scrapped, or destroyed. the auction house is a personal friend of the seller. VIN history until the first policy renewal period. have received no response as of yet. Who is at fault here? DMV for issuing title? Seller? The friend who bought it at auction? Trying to leave out the sob story here but me and my family are really dying here. You could have, and should have, had the car inspected by a mechanic before you bought it and run your own history report. You would have found all this out before buying. I not a professional mechanic, but I do almost all my own repairs. All of the damage was underneath the plastic fascia, it had a respray done, and was put back together with factory parts (only ones available). Short of disassembly, if wasn't able to be found. Not even the dealer suspected prior to removing from bumper to replace the radiator. edit: I mistakenly a$$umed the insurance company would check the VIN when provided for purchase, title status beign something majorly affecting coverage and all. Which I did prior to paying for the car. They told me they do check the vehicles, but most don't take place until the first renewal period. Again, you could have run the history report before buying. Used cars are sold as is. Since neither you nor a dealer could even see the hidden condition it's unlikely that the auction company or the subsequent buyers and resellers knew about it either. You'd have a hard time proving fraud. It's unfortunate but you don't appear to have any recourse against anybody. Pay for your repairs and get whatever use out of the vehicle you can get for as long as you can. I'm curious when you say a private party seller gave you a warranty. How did they do that exactly? Who's name is on the title, was it the person you bought it from or was it the person who bought it from the auction? It was sold under factory warranty, 50k bumper to bumper. Name on the title is the wife of the man I bought it from. I highly doubt the seller knew about the problem. It became a problem for ME because I live on rough roads, the radiator leak seems coincidental to the previous damages, I'm sure it was replaced with a new factory unit, that just happened to then start leaking. The title shows 7k miles put on the vehicle since he purchased it, consistant with a year of daily driving. I don't think this was intentional by him. Sadly, there IS no use I can get out of it. As far as I can tell, it's not even legal to sell except as scrap or parts. Even if it's fixed, it's a paperweight. DMV is aware of this now since I applied for investigation, I'm sure they will flag it and pull registration. What I don't get is this, I only see those three entries on the title on the history report. Shouldn't there be a title entry for every time it changed hands? This is called "Title Washing" - do a web search for it - it's a somewhat frequent occurrence (unfortunately). Managed to contact the seller. The "friend" is now absent, and the seller claims he is the one who got from auction. The seller then admits that he sells cars sometimes (did not specify how many) and sometimes auctions will salvage a car, but that he was unaware of this. I'm inclined to believe the man, I wouldn't let my wife drive it, who knows if the SRS system even functions? I am having the vehicle repaired so it will be in as received condition. Still can't be driven. I've dug into this deeply now, and it reeks. I paid for an in depth vehicle check. And paid for a consultation. Was advised to go to the police. I delivered the vehicle in police presence, and in front of an officer, the seller denied purchasing the vehicle from auction, and insisted that it was a 3rd party whose name he could not recall, nor could he remember what documentation came with the vehicle. Also refused refund. The title history tells a different story. Police say they can't help because you can't prove intent. I see intent all over the history here. I see two reported accidents and an eight month possession period. How do I get that information, on who made the claim and what it was? The one thing the police did help with, I got the guys full name. I was hoping the DMV Investigations unit would dig into this, on calling them this morning to provide the full name, I was told the investigation was closed on the 17th by a supervisor. I left a message with the supervisor who closed the case, asking why when the owner clearly had a junked car titled after a long possession period. Not holding my breath. I was given the word from sources that will remain unnamed that the DMV investigations unit is pretty worthless. They have the OPTION to pursue a case or not at their discretion, regardless of complaint. Next option is to what? Call the DA and complain about lack of action? Hire private investigator? I'm already resigned to getting nothing out of this. But I want who did this to never do it again. You could attempt to sue the seller to recover your costs but, with a used vehicle, your odds of success are slim. How much can you get for selling parts? You might have to be satisfied with that.